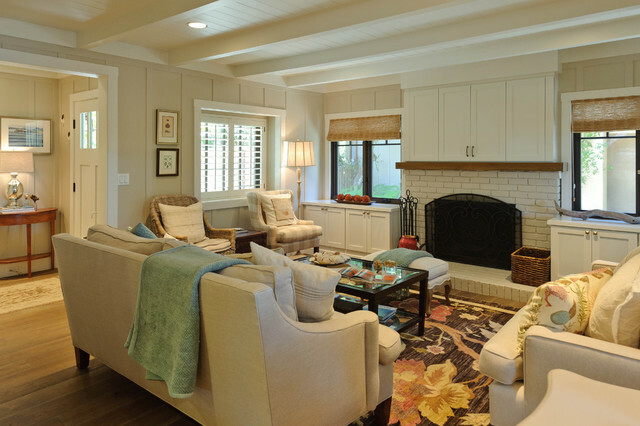 Carmadillo Living Room - Beach Style - Living Room - San Francisco - by Regan Baker Design Inc.
What is the wall & trim color? Great photos, but my significant other says if he has to live in another beige painted house, he's leaving me. So I'm looking at greens at this point. what is the spacing of the board and batten? thanks. what paint color did you use on the fireplace brick? Size - What is the size of this living room? It seems to be a great size, not too small but not too big.